This listing is for custom fine art photography note cards with the option to add personalization for free. Choose any image from my Etsy shop to create a gorgeous piece of art on the front, then add any text to make it your own (or keep it as is, without text). The best part is, the card stock is so beautiful you or the recipient could frame it as artwork! Choose from flat cards (2 sides) or folded (4 sides). You can add any text to the front, back, or all of the above. You can add your name, personal monogram, a quote, you name it! There are more colors and fonts available so if you don't see what you need just send me a message and I'll get you something special. 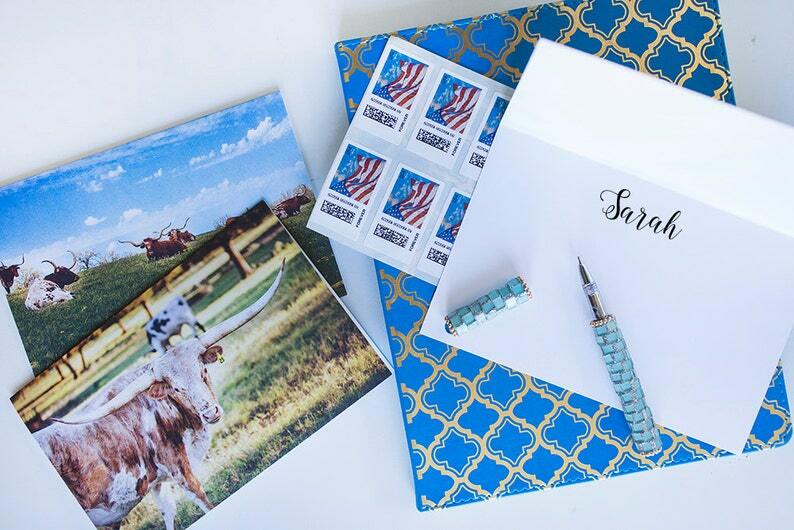 The note cards come in packs of 25 and are printed on nothing but the BEST fuji luster papers. They come with a matte finish to make writing on easier, but you can order them in semi-gloss if you'd like. Includes 25 standard white envelopes. Original Fine Art Photography - Taken in Dallas, Texas, San Francisco, South Carolina, France and beyond. Check out the facebook page for fun shop updates and sales! I am a professional natural light photographer based in the Dallas/Ft. Worth Metroplex (Texas :). I am obsessed with nature, landscapes, and perfect gardens. My work is inspired by the landscape as it changes through the season and finding beauty in the everyday. Love love love my custom pieces from Jessica. So easy to work with and very responsive on messages! Can't wait to get them framed! The picture just arrived! Omg! So beautiful. Thank you for customizing the dimensions to fit our old frame. Love it!!! Quick shipment and print turned out great! I process orders once payment has been completed. It generally takes 1-3 business days for the prints to be completed and shipped. *Custom orders may take longer. If you are not satisfied with your purchase, I will exchange your item(s) or refund your money (minus shipping costs) up to 10 days after you have received your order. You will be responsible for returning items in their original condition as well as return shipping costs. *Custom orders can not be returned. If your item arrives damaged please let me know within 10 business days, and provide me with pictures and a detailed description of the issue so I can get a new item made as quickly as possible. General shipping for mounted prints are $7.99. Canvas, larger items, and custom pieces increase shipping prices. EXPEDITED SHIPPING is available upon request at an additional cost of $15-20 depending on the order. Please contact me to set up your expedite shipping. TRACKING INFO - I pride myself on my open communication and up to date processing information. I send messages to let my customers know the status of their orders and provide detailed tracking information for your convenience as soon as it's available. I can now ship to Canada as well! The printing press I use ships direct and charges $10.50 plus 10% of the order total. This puts your shipping charge usually around $12-$13 for Canadian shipping and would go up based on how much you order (canvases are more).